What’s the most interesting thing about the animals you work with at the Fort Worth Zoo? It’s very interesting how almost each and every animal has its own distinct traits. When you first start to work with a group of, let’s say, ten kangaroos, you have no idea of who is who and it can seem very difficult to tell them all apart. But if you pay enough attention to them and observe them on a regular basis, you eventually see that they are all very different and you can’t imagine how you once thought that they all looked the same. What advice would you give to students who may pursue a job like yours? Get as much “hands-on” experience as you possibly can. Having a formal education and lots of knowledge about animals and biology is great. But you don’t begin to learn and grasp what animal keeping and husbandry is all about until you’re actually up-close-and-personal with the animals. What is the most fascinating animal in your care? They certainly may not be the most exciting animal you can imagine, but zebras have always been a fascinating animal to me. For some reason, I have admired them since childhood. 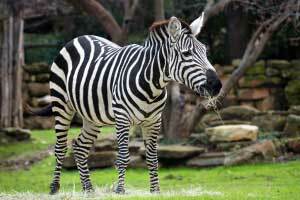 The Fort Worth Zoo houses Grant’s zebras in our animal collection, but my favorite species is Grevy’s zebras. They are very tall, and can make a vocalization that sounds like the braying of a donkey! What is your favorite amazing fact about the animals you work with? Female kangaroos can have three joeys of different ages all at the same time. They can have one in the uterus that they are pregnant with, one in the pouch that is nursing, and one that has outgrown and left the pouch, but is still coming back to the pouch to nurse. Even more amazing, female kangaroos can produce two different types of milk to meet the nutritional needs of the two nursing joeys that are at different stages of development.